Hiya guys! I'm bouncing back on my feet this week with some swatching madness. Let me just say, stamping fans will definitely be getting a kick out of this post. 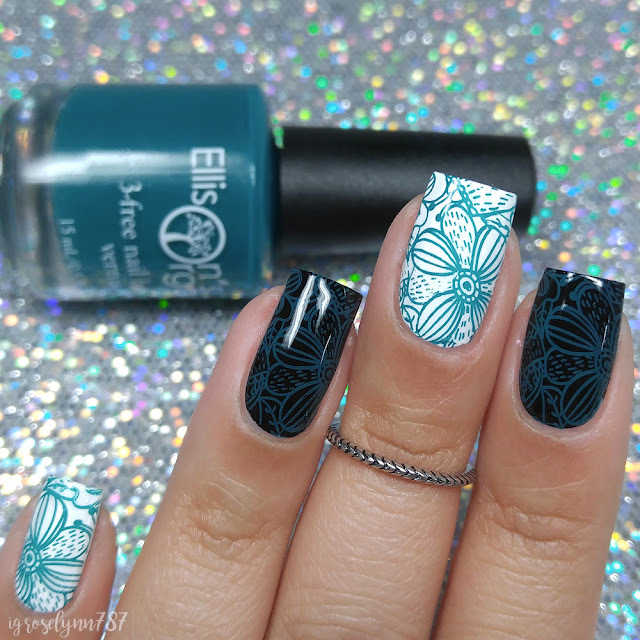 Today I'm sharing swatches for Unteal Tomorrow from Ellison's Organics, which is a cream stamping polish. Like any stamping fanatic, I'm always on the lookout for the best polish to use. Spoiler alert, you're going to want to add this one to your collection! Unteal Tomorrow from Ellison's Organics will be releasing at the end of March. Each full-size 15mL bottle will retail for $12. As always, there is free shipping on all orders of $30. Unteal Tomorrow can be described as a rich teal cream. Isn't this such a vamp-licious color?! It's very bold and striking, even in just a cream finish. The formula has a smooth and really opaque application. It's pretty much a one coat wonder! The consistency is spot on as well, not too thick or too thin. It dries to a nice natural high-shine finish with no streaking or patchiness. And now for the best part, despite it's pigmentation there is no staining whatsoever to my nail or cuticles. Shown in one coat and sealed with a glossy topcoat. And now for the stamping test, because after all this is a stamping shade. I wanted to make sure to use a detailed stamping image to make sure it would pick up all the details. And I was definitely not disappointed! The color shows very vibrantly against the white background, but also manages to show against the black. I was actually pretty surprised at how well it showed against the darker base, because the polish itself leans on the dark vampy side. 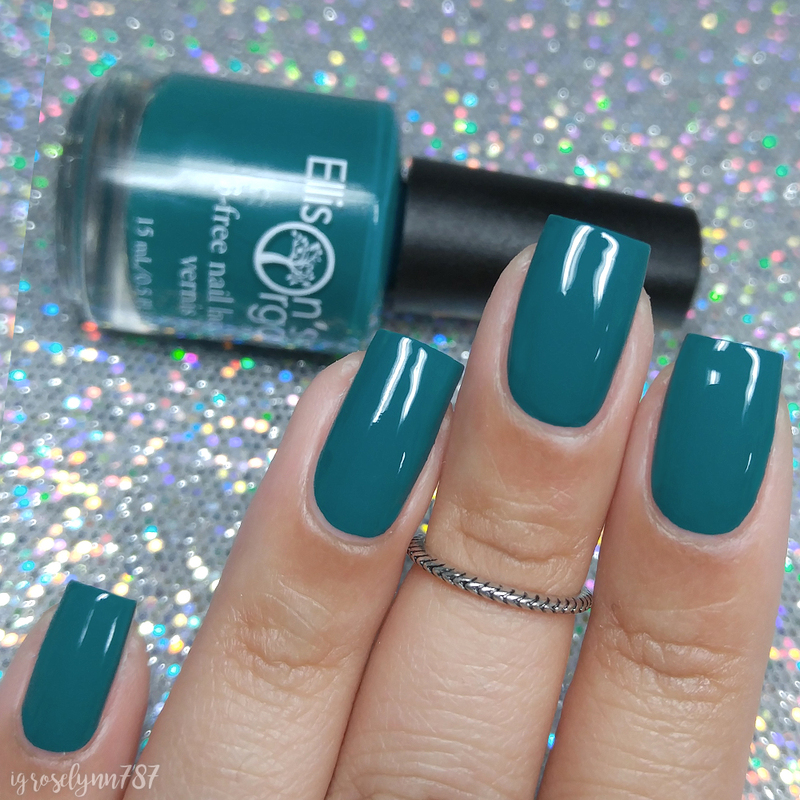 Overall I think this is by far the best stamping polish I have used from Ellison's Organics! I was completely blown away with the formula! It has such a perfect opacity for nail art in general, not just stamping. I really hope to see more polishes from this indie with this exact formula because it really has a lot of promise. To recap, Unteal Tomorrow from Ellison's Organics will be releasing at the end of March. Each full-size bottle will retail for $12. As always, there is free shipping on all orders of $30. Oh my goodness, that stamping looks phenomenal!